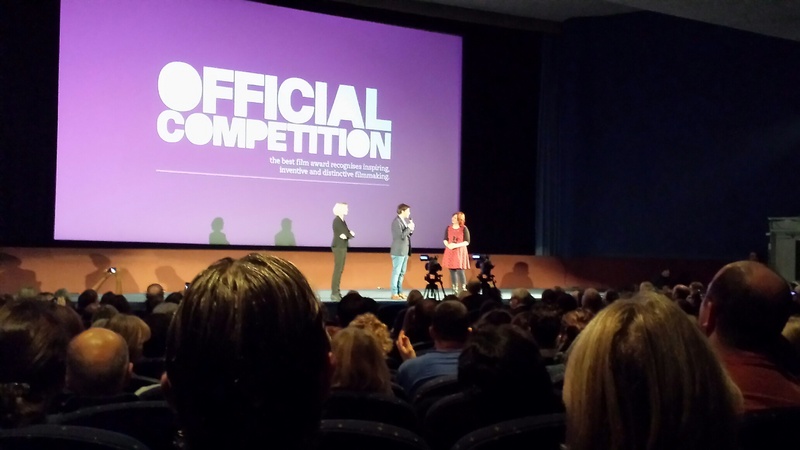 Q & A with Francois Ozon, Director of the New Girlfriend, at the London Film Festival 2014. NHYM. Copyright 2014. The London Film Festival ended last Sunday but I still managed to fit in two Premieres in my busy schedule. It is less about red carpet glitz and glamour (which lasts about 10 minutes), and more about the love of film and showing off London’s creative enthusiasm for indie, international and art house films. I chose two films to see this year, Foxcatcher and The New Girlfriend, from two very different directors; Bennett Miller who makes a movie every four years (Capote, Moneyball) and Francois Ozon (The Swimming Pool, 8 Women, Jeune et Jolie), a prolific French director who makes approximately one movie per year. Miller took eight years to make this project reality and found it difficult to find funding for this movie since Hollywood these days is more about Blockbusters than making great films. Ozon proudly doesn’t make high budget films so that he can have full creative control of his films. The Q&A sessions with the directors and actors is my favourite part of the festival, providing insight into the motivation and passion behind the making of these films.The London Film Festival is a place for talented directors to showcase their creativity and share it with cinephiles like myself who prefer to watch ‘proper’ films rather than action-film/ marvel-comics/Blockbusters. Foxcatcher is a dark, disturbing, drama based on a true story about a pro wrestler who finds himself in a twisted and uncomfortable partnership with one of America’s richest men, John E Dupont, played by Steve Carrell, who attempts to create ‘the best wrestling team in America’. The movie looks into the cringeworthy and gritty life of a pro-wrestler, Mark Schultz, played by Channing Tatum, who despite having won a Gold Olympic Medal in wrestling, lives a depressing, tortured life in America, in the shadow of his greater, older brother, Dave Schultz, played by Mark Ruffalo, the more charismatic, charming and intelligent brother that spends his life looking after his younger brother. One of the early scenes of the movie shows the two brothers wrestling like two deer fighting, showing the physicality and imbalance of their relationship. Channing Tatum is perfectly cast as Mark Schultz, the naive, influenceable, not-so-intelligent, hulk-like, younger brother with cauliflower ears full of vulnerability (Tatum brilliantly plays the part, but it is difficult to tell whether he is really acting or whether he is just playing himself). For those who have read my article on the SuperRich, this movie looks into the life of one SuperRich man, John E Dupont, who grows up a social misfit, trying to constantly prove himself to himself and to his mother, and convinces Mark Schultz to wrestle for him, by using his intellectual and financial superiority. He probably uses him to get to his brother Dave Schultz. Steve Carrell, who plays John E Dupont, is superb and unrecognisable as the actor you previously knew him as. No longer the funny-man, Carrell transforms himself into a lonely, unsettling, socially awkward, yet powerful John E. Dupont, who manipulates people around him to do exactly what he wants. Carrell is looking at an Oscar nomination (for sure), and possibly a win (he will deserve it). I would watch this movie purely for Carrell’s performance, which gives us an insight into a disturbed SuperRich, who never has to achieve but feels the need to make his mark, and that wants sympathy when he says his only friend growing up was paid for by his mother, but does not know how to be a friend. The breakdown of the relationship between Mark Schultz and John E Dupont could have been better developed in my opinion, leaving the viewer unsure exactly happened. The movie slows down towards the end, at points I found it too long, and I would have wanted more of a build up to the climax. And then, like life, the movie completely changes in an instant, the foreshadowing too evident, and it ends too depressingly for words. This is not a movie of words and dialogue, it is a movie based on reality, on unhappiness, and therefore by definition, is not a Hollywood movie. Verdict: This is a dramatic and dark film worth watching for Steve Carrell’s Oscar-worthy performance and transformation and to see Channing Tatum finally turn into a real actor. Francois Ozon is the French answer to Pedro Almodovar, so if you don’t appreciate Pedro, there’s no point in reading any further. He has directed 15 feature length films in 16 years and is one of the most prolific French directors of our time. He often delves into themes of sexuality and gender roles, and pushes the boundaries as far as he can. He directs his films in a similar way to Almadovar, fantasy-full, unbelievable and filmed through rose/orange/purple-tinted lenses. For this film, as Ozon mentioned in the Q & A session, he wanted it to be a modern fairy tale about unexpected love. I will keep the twist to myself, as the film is best seen undistracted. The first 10 minutes of the film are my favourite part of the entire film; it is a montage of the beginning of a friendship, a love between two friends and death that tears them apart. I was in floods of tears after those five minutes, and to me, this could have sufficed as a short film on its own. It reminded me of the more elaborate, longer, more melodramatic ‘Beaches,’ a story of friendship and love, which remains to this day, close to my heart. I am a romantic in all kinds of love, including the beauty of friendship. The movie is about a young husband’s reaction to grief of losing his wife in a most unusual way and how he deals with being left to care for a small baby, played by Romain Duris (who is rather good and comfortable playing this role). He asks his wife’s best friend for help and advice, played by Anais Demoustier, who becomes embroiled into his secret, and isn’t sure where to turn. Romain Duris (The Beat that my Heart Skipped, Heartbreaker) plays a wonderful protagonist who is easy and fun to watch, against Anais Demoustier, an expressive and likeable actress whose name you will hear more of in the future. The film is mostly endearing because of its actors, but it feels at times confused, and quite convoluted, but I still enjoyed it nevertheless. Verdict: If you love Pedro Almodovar, you will love Francois Ozon’s films, so check it out.